Two of my wonderful friends, Leslie and John, are having a baby girl. 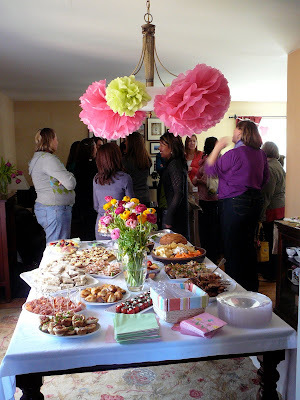 To celebrate this great occasion, my friend Sarah and I hosted a baby shower for Leslie. 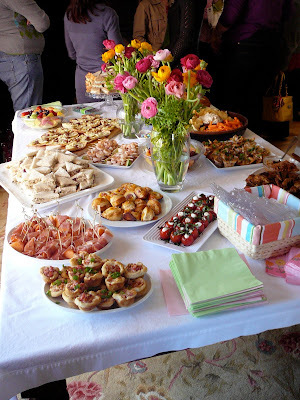 Sarah and I made a ton delicious food, hung adorable decorations, served tasty drinks, and hosted a wonderful shower. No baby shower is complete without dessert, so expect to see more posts in the next couple weeks. I wanted to make something to give as a favor and came up with these adorable cookies. 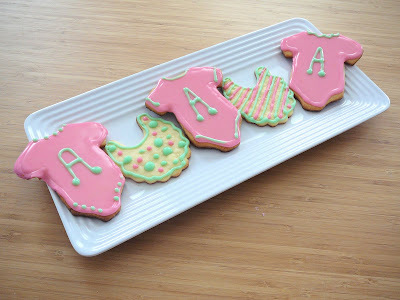 The baby's name starts with an "A", hence the "A" on the onesies. Unfortunately, I put these cookies in the little bags I was packaging them in a little too earlier and all the icing smeared and slid off. My tip to you if you make these....make sure they dry completely before you package them up! In case any of you are interested, I have included our menu from the shower and a few pictures of the food at the end of the post. Just shoot me an email if you want an of the recipes. Mix together the flour, baking powder, and salt, set aside. In a large bowl, beat together the butter and sugar until light and fluffy. Beat in the eggs one at a time, then stir in the vanilla. Slowly beat in the flour mixture until fully absorbed. Separate dough into two disks, wrap in plastic wrap, and refrigerate for a minimum of two hours or overnight. Preheat oven to 400 degrees F. On a clean floured surface, roll out one disk of dough at a time to 1/4 inch thickness. Cut out shapes using cookie cutters. Bake 6 to 8 minutes in the preheated oven, or until edges are barely brown. Remove from cookie sheets to cool on wire racks. Decorate as desired.